With the first major snowfall of the 2015/2016 season behind us, residents should be aware of the newly revised snow removal ordinance. Property owners have 24 hours after the snowfall has ended to remove snow accumulations of three inches or more, or any dangerous ice from public sidewalks and ramps leading to crosswalks. If multiple snowfalls add up to three inches, then the same rules apply. Instead of just ticketing delinquent property owners, the City can now step in and remove snow or dangerous ice. Property owners would then get a bill from the City for the abatement plus at least a $75 additional fee. The penalty to property owners will increase with each offense, with the fourth violation in a calendar year resulting in misdemeanor charges. The City says that abatement and enforcement will be a priority in areas heavily traveled by pedestrians, such as those near businesses or schools or on walking routes to those areas. It is yet to be seen how well this ordinance will be enforced, and if the city will clear city owned properties which were not cleared last winter. 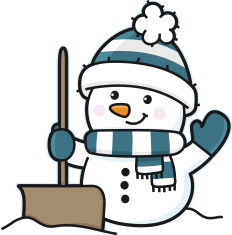 Residents should call Neighborhood Services to report sidewalks and crosswalk ramps that have not been cleared.